During our final week in Japan, Shiga-san, Ben's Japanese exchange host father, generously came down from Tokyo to see Zen, and then take Ben and I on a trip to the former Japanese capital of Kyoto, about half an hour from Osaka by express train. Kyoto is by and large another modern Japanese city - ugly and sprawling. 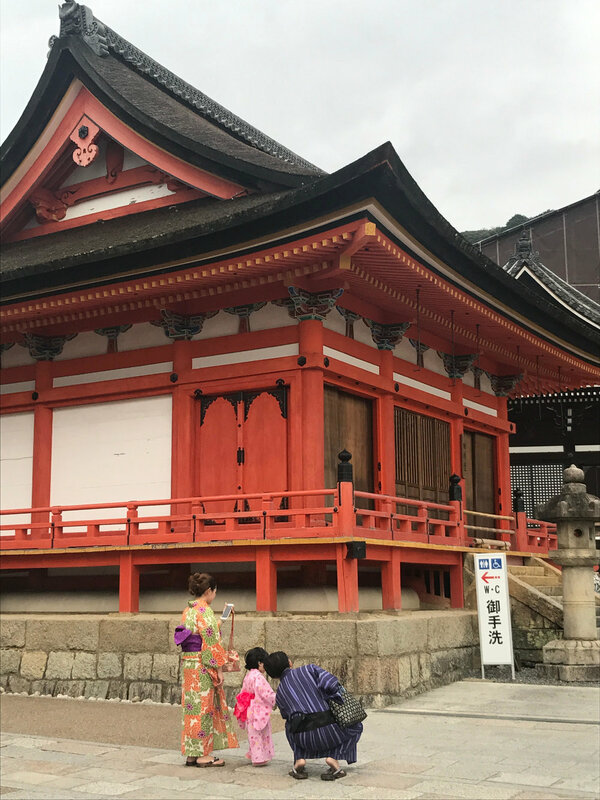 But tucked in among the concrete are some fabulous temples, gardens, houses, and even a traditional area with narrow streets, wooden houses, small shops and restaurants. Our first stop however was for a more recent cultural invention: fire ramen noodles. In fact, according to the restaurant's website, fire ramen is "the one and only experience in the whole world". Lucky we didn't miss it. As much a performance as a meal, the charismatic owner ushers around a dozen diners in at a time, yelling at anyone else who dares put their head round the door. 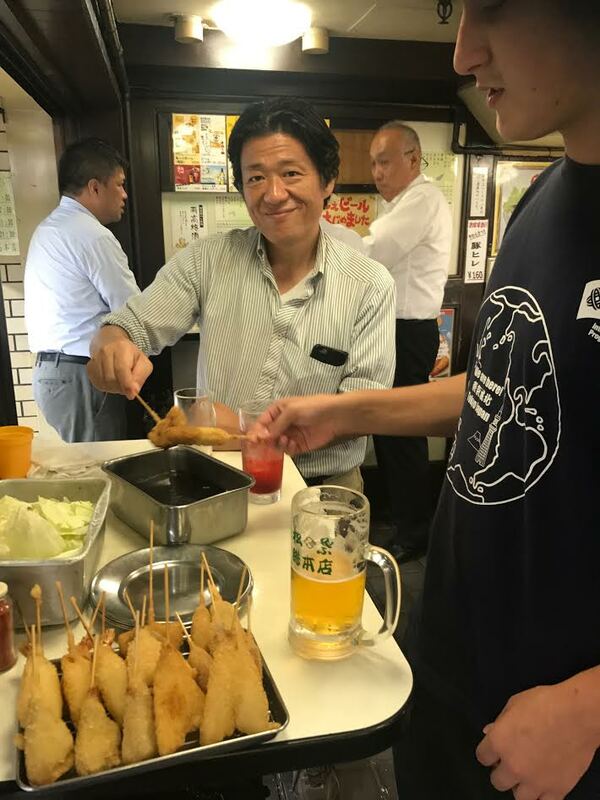 Once inside, you put on protective aprons and watch the preparation of the ramen noodles, presumably in much the same way as ordinary noodles in soup, but with the addition of a thick layer of spring onions. Then the chef goes down the row of diners pouring flaming oil on top of the spring onions, which flare up, sending flames to the ceiling. It's nothing like the pretty blue glow when you set your Christmas pudding alight - although a sign assures patrons that the shop has been serving fire ramen for 30 years and "nobody has been dead for now". So that's OK. It's pretty delicious too, if you like a hint of singed-ness. Next we went to the Kinkaku Ji Temple, or Temple of the Golden Pavillion. Fire plays a part in this site too, as the temple was burned down by a novice monk in 1950, so the present, reconstructed, structure dates from 1955. It's fabulous. Outside the temple grounds are a cluster of streets with traditional shops and houses; very touristy, but very pretty. Green tea was much in evidence here too, with products - from soap to biscuits - available. Green tea is obviously the pumpkin of Japan. Is there anything you can't use it for? Our last treat was a kushi-katsu dinner in a mall below Osaka central station. A low ceilinged dive sort of a place, the waiting staff wore overalls and white gumboots; the patrons were almost exclusively men in work clothes drinking beer and sake, and eating deep fried stuff on skewers. It would have been churlish not to do the same.